Earlier this year I posted we’re expecting when two of the feathered residents built a nest and laid a clutch of eggs in the lower pond at Sydney Park. The park is my morning daily walking route, and a lovely stroll on a Sunday with the G.O., so we were able to conveniently keep an eye on the happenings. And happenings there were… a saga worthy of a soap opera: hope, tragedy, recovery, and triumph. Sadly, in June’s winter rain, the nest and eggs in the lower pond were flooded. An interloper swan ‘Trudy the Intruder’ tried to tempt Henry away from struggling Matilda and their unborn progeny into her feathered clutches – Trudy secretly wooing Henry on neighbouring ponds – Matilda ousting the hussy from the home pond and away from fickle Henry. Henry resisted the temptations of young Trudy. He and Matilda moved to the middle pond, built a new nest and started again. 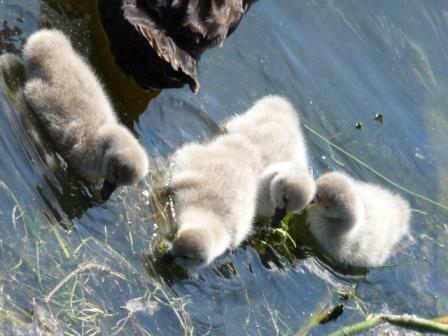 A couple of days ago, the cygnets hatched. It’s early days yet, but 4 out of the 5 are doing ok and enchanting their fans, doing the circuit of the pond with mum & dad. I never dreamed of such happiness as this, while I was an ugly duckling. This entry was posted in Blog and tagged Australia, my life, nature, swans, Sydney Park. Did you have to restrain yourself from hugging them? When my friend and I went to the Hamakua Marsh I had to sit on my hands as the little chicks passed by. The parents trusted my friend and I so much that they brought their little chicks near us once everyone went home. Nice that the feathered residents of Hamakua Marsh were so friendly. The cygnets are very huggable but mum & dad swan even though they trust us to feed them bread, would have been most upset by any hugging. How fantastic to have witnessed that. We get lots of ducks around here, and we all stop on the road for them, but I don’t know where they nest. Great images. Lovely. Can’t remember the last time I saw water fowl. Nearest I get are my chickens 🙂 and my handsome cockerel. Baby everythings are adorable. But those baby swans are so precious and fuzzy that looking at their picture gives me a tactile sense of how it would feel to touch those soft feathery backs. Wonderful!